I wrote a Christmas letter two days before Christmas and it remains unsent because of the busyness since then. However, while I was sitting in church on Christmas Eve, I was so overwhelmed by the beauty of the service and the meaning it had in my life, that I re-thought my original Christmas letter. I've been trying to decide if I could capture even a whiff of the feelings stirred in me during that candlelight service. They were such a contrast to what I wrote in the letter that I wanted to rewrite it immediately. I arrived home the evening after Christmas after having a lovely Christmas Eve dinner at Martin, Christine and Lionel's place. I left in time for services at the Bellevue UCC where Jeni and Ron were singing in the choir. Then, Christmas day at their house. I left my dog in the care of a person recommended to me by my neighbor. She had used her several times to house sit. I was home a short length of time before this person let herself into my house -- she had come to walk Kinsey although I had told her that I would be home by Sunday evening. Unfortunately, she was also tipsy, a bit scatterbrained and maudlin. She kept telling me that Kinsey didn't want to walk with her, but then she said she was able to walk him. Since I had no surprises littering the house, I presume that she did get him outside to walk. But, I never got a straight story. It took me quite awhile to get rid of her while she tried to share her life's woes. So much for a new housesitter/dog walker! My neighbor is going to be embarrassed when she asks about my experiences while I was away. I got my key back, but I wonder if I should have the door lock changed. Kinsey seems no worse for the wear - and I've been relaxing and trying to get into some kind of chore mood. There are several things that I would like to do, but vacation mode has prevailed. I had to count money at church yesterday morning with Barb (my counting partner). There were three services of money to count - and the end of the year checks from various parishioners. It was a big morning so we treated ourselves to lunch. Then, I went out to check Dani's house and to the library to take back a lone CD that I found in my car that didn't get turned in last week. I thought of going to the movies, but missed the 3:15 show and didn't want to go out in the evening. Ended up with a bowl of soup and watching television until bedtime. Today I awakened with a slight headache - rare, but understandable since I had no tea yesterday - it felt like a caffeine headache. Since then, I've been meandering through computer stuff and waiting to feel better so I can get to work. Maybe I'll actually write that new Christmas letter. In any case, I'd better get on with my day. Today is Christmas Eve and I'm doing one more bit of cooking before heading south for two days. The fantastic Pam is cleaning my house while I am sitting playing on the computer. I live in fear of the day that she retires on me. I have done little cleaning in the past 25 years. With a house the size of mine, there is always something to be done. But, she is my angel, my right hand, my saving grace and my friend. She just told me this morning that she is going to have her eighth grandchild in August - that is indeed a lovely Christmas present. I'm waiting for my neighbor's friend to come and meet Kinsey. She house sits and takes care of animals. Since she is housesitting just down the street, she will walk Kinsey with her own dog while I am gone. It was nice to hear about her. Now, I hope Kinsey and her dog hit it off - he is much happier at home than in a kennel. It is about 2:30 a.m. in Hong Kong right now. Dani and family will be waking to greet Christmas a day earlier than the rest of the family. It does answer my childhood query about how Santa can cover the whole world in such a short time. He actually has more time than I ever imagined. KJ and Oscar dropped by last night with KJ's aunt, uncle, and cousins and about 7 pints of Mallard ice cream. KJ and Bryce traveled to China a few years ago with her uncle Billy who is a photographer who often travels and speaks fluent Chinese. He would like to meet Charles when he next goes to Hong Kong. We had an enjoyable visit. KJ is staying at Dani's house during her visit. Oscar wondered where Nico was when he came the other day. The last time he was here, he and Nico went out trick or treating for Halloween. Bryce arrives this afternoon in Vancouver just in time for Christmas. Friends and family are such gifts for Christmas. Oh, and a clean house!!! Last night I had a lovely evening with my dinner group, friends who have met for over 20 years once a month to share a meal. At Christmas we exchange gifts. For the past two years, we have also said goodbye in December to one of the couples who have started living in Arizona for the rest of the winter months. After Don died, I was going to drop out of this group of four couples, but got persuaded to stay. So, we are now seven instead of eight. A few years ago, we stopped going out to a restaurant for our December meal and this year we switched what people are to bring when we meet -- we are still evolving even after years of monthly meals. I guess that is a sign of a healthy group, to be flexible and change with the times. That is what I'm trying to do this Christmas. For the first time in years, I am not having anything at my house. I did invite my Rummy Cubes playing friends over the other night, but I usually have a neighborhood party and family around for Christmas Eve and Christmas Day. When James was here, he helped me put up a tree and my big wreath is on my front door, but other than that I'm sparsely decorated. I have some candles here and there and greenery on the hearth, but all my nativity collection is still stowed away, my Santas are asleep in their boxes, my little village quiet and dark, and I've been drinking tea out of my regular pots and cups since the Christmas stuff is up in the cupboards. AmySue, who usually does the neighborhood Christmas party with me, is in Seattle with her husband and family keeping watch over his mother who is dying of brain cancer. Dani and family are in Hong Kong. I'm spending Christmas Eve with Christine, Martin and Lionel (and Christine's parents) and Christmas Day with Jeni, Ron, Allie, and Nicole (and Keith and Eulalah will join us that evening). A different kind of Christmas, but a pleasant one also. I have missed being in my own church for a few Sundays and will miss Christmas Eve services. But, I have been baking and making some gifts, I had a marathon shopping session on Tuesday morning. It was so successful that I treated myself to lunch at the tearoom and then went to Harry Potter. Yesterday, I wrapped all my presents. Today I hope to get to a Christmas letter. Perhaps there is something to be said about slowing down and changing your normal routine. I do not feel rushed. I have been listening to more music and reading each Christmas letter when it comes instead of putting it aside for later. My sole activity today is to get my haircut. I'm not frantically getting ready for Christmas Eve dinner or changing sheets for the coming crowd of family. You know, I might get used to this slower pace! At least, I will not have to spend five days putting away all the decorations this year. Maybe I'll finally get to painting the living room and working on my guest bath. See? Everytime I slow down, I think of more things I can do - Relax, Marilyn, enjoy the rhythm of a simpler life. James has been living with me for two weeks while his mom and Nico are in Hong Kong. Today is his last day of school, and I put him on the plane Sunday in Vancouver to join his parents. He has been a dear fellow in many ways. I'm sure that I do things differently than his mom which drives him crazy at times. For one thing, I was picking him up every day from school until he told me that he likes to meander with friends after school and would rather call me when he is ready to come home. It is the only free time that he really has in his busy schedule. I just presumed I was supposed to be at school at 2:30 and we had a bit of a tussle until he clarified things. Now, he calls me around 2:30 and I go and pick him up. It is not that different, but he feels he has some leeway to walk his friends to the bus stop. It is the 6:15 a.m. that we leave home that is the killer - especially after nights that he has to play his sax somewhere. Between his lessons, rehearsals, and various gigs - he has played almost half of the days or evenings since he has been here. Of course, there have been holiday concerts, etc. The amount of homework and tests have been over the top. He is a good student and so he has been anxious to do well. His Honors Biology work is simply staggering. I never remember any of my kids working so hard in high school - or worrying so much. I'm going to be glad for him to haver a few weeks to relax - although he tells me he has to take his schoolwork to Hong Kong. It has been fun going to his gigs. 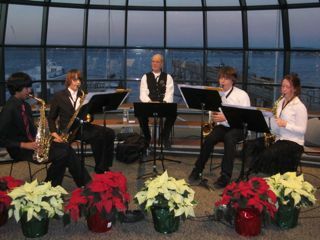 Last night his sax quartet played for a retirement home. I can't believe how well he plays after just one year. His teacher mentioned that to the audience - made a point that James has only played for one year. He is proud of him. Then, at the school holiday concert, James played the sax and then got up and went over and played the string bass for a couple of songs. He is a versatile and talented musician. I knew that when, as a two year old, he went around constantly singing. The family would be toted around Vietnam and he would sing at the top of his lungs. Although he played the cello as a little boy, his hands were so big, I knew if he kept up playing strings he would end up on the bass. While he has been here, he has fiddled around with my piano and can play several things which he has taught himself. He simply breathes music. I think I'm going to sleep for a week after he leaves. I'm also going to have to turn my head towards Christmas. I haven't had a moment to plan. I managed to get a tree the day he was playing at Haggens and he set it up for me. This week I have trimmed it and got the big wreath outside. But, I'm not going all out this year since I'm not having any events at my house. I am making some Christmas gifts in the kitchen, but I'm trying to keep things low key. If this is the second entry you have read about James, I apologize. I put one up and Martin mentioned that James might not like my tongue in cheek about what it was like living with a teen. So, I erased that one. I decided that he might not take it as irony. I decided to rewrite it. It probably exists somewhere - I can't figure out how this technology works with erased entries. Not much else for now - got to go check what is bubbling on the stove. Don't get too harried with all the holiday prep! I feel like one of those plastic Bobos that keep getting knocked over and bobbed back up. This is my third cold this year. It knocks me out for a week or so before I get back on my feet. I'm tired of this process - and wonder what is happening to my immune system. I'll ask the doctor today as I'm going in to see if I need an antibiotic to knock out whatever is going on once and for all. Maybe it is just increased proximity to four year olds, but I can't blame Nico for all the colds although I do seem to sound just like him with my recent cough. On another note, I've been running around (cold and all) to observe my interns in their final week of the quarter - since if they do not finish their quarter, I do not get paid. When I'm home, my nose has been buried in a book or my computer. It is a great time to catch up on my favorite blogs. I thought I would take a moment to tell you about them. They are a constant source of enjoyment and sometimes amusement. Another food blog I follow is Molly Wizenberg's Orangette < http://aboutorangette.blogspot.com/ > Molly lives in the wider Seattle area and I fell in love with her cookbook a few years ago. She writes a column for Bon Appetit and has a widely popular blog about recipes. My latest acquisition was her Cranberry Chutney recipe which was delicious. Her husband has opened a New York style pizza restaurant in Ballard which has become quite popular. Her cookbook tells about their long distance romance after he read her blog many years ago. She is cute and perky and her recipes are quite delicious. These are my three favorite (and light) food blogs - there are others but these three make me smile while giving some good ideas. Of course, I continue to follow Nancy Leson of the Seattle Times - if you want the ins and outs of the Seattle food gossip, you must follow Nancy. She tells who is going out, who is coming in, who is popular, who is serving what and where to go in the greater Seattle area. Her latest writings about seafood vendors in the Pacific Magazine were terrific. Her blog is All You can Eat and can be accessed through the Seattle times. Maybe I'll talk about writing bogs sometime.